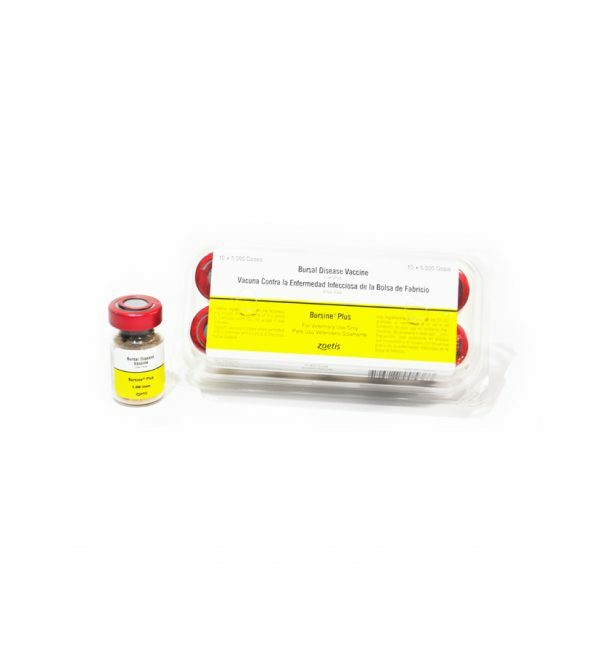 Bursine Plus® is a monovalent modiﬁed-live virus vaccine for the immunization of chickens to aid in the prevention of infectious bursal disease (IBD or Gumboro disease). Modiﬁed-live infectious bursal disease virus, intermediate Lukert strain. Bursine Plus® vaccine is recommended for the immunization of chickens to aid in the prevention of infectious bursal disease (IBD or Gumboro disease). Bursine Plus® is particularly well suited for priming of breeder replacement pullets prior to the vaccination with inactivated IBD vaccine. Vaccinate healthy chickens via drinking water at 7 days of age or older. When used in breeders as a primer for an inactivated infectious bursal disease vaccine, Bursine Plus® should be administered via drinking water 6 to 8 weeks prior to administration of an inactivated product. Dosage: One dose per bird. Store in the dark at 2°C to 7°C.